I can’t believe this is my final week as a guest designer for Concord & 9th! It’s been a lot of fun creating projects from the November release, and I hope you all have enjoyed following along. It feels good to finally be making cards consistently again! 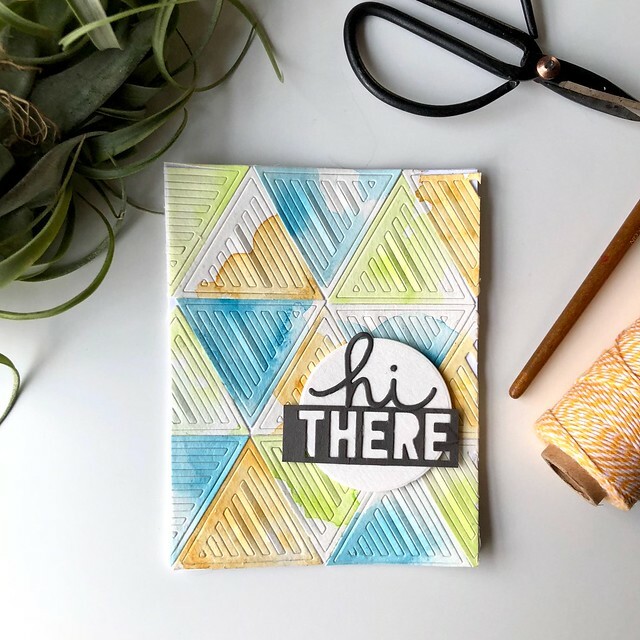 Today I’m sharing projects made using the Geometrics stamp and die sets. I think these are my favorites! Both the stamps and dies are really versatile. I even made two cards this week! 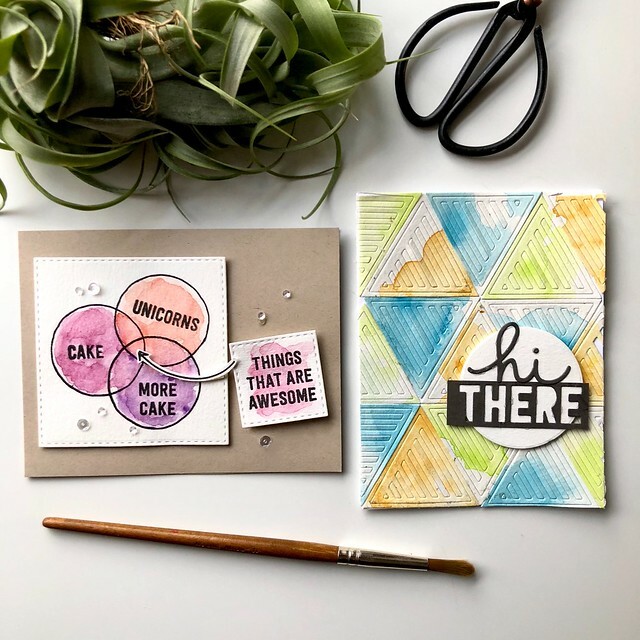 For the first, I used elements from the Geometrics stamp set and made a Venn-diagram on a square panel and filled the circles with things that are awesome, obviously. I watercolored most of the elements and then put everything together onto some craft cardstock, finishing up with some sequins, of course. The second card was a bit more tedious, but I really like how it turned out. I die-cut a bunch of triangles from the Geometrics die set from some watercolor paper scraps I had used for another project (which I’ll share soon!). I organized all of the triangles onto a A2 panel. Any parts of the triangles that hung over the edge of the panel I cut off and tried my best to make everything look neat and tidy. I used the sentiment words from the die set for the sentiment as well, which I mounted onto a circle-cut piece of watercolor paper so that the sentiment would stand out from the background a bit. I contemplated adding sequins to this one too, but didn’t end up going for it. Voila! Two final cards to wrap up this month’s stint as a guest designer! Happy Friday! 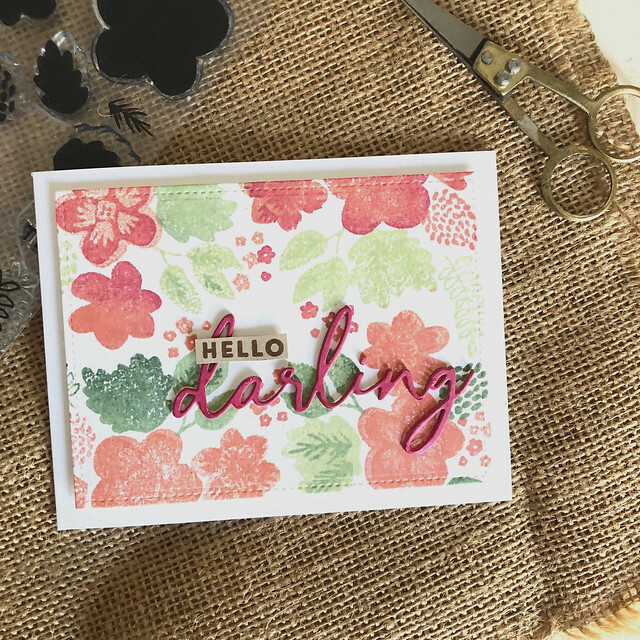 Today I’m sharing two pretty floral cards made with two new Concord & 9th products, the Darling Petals Turnabout Stamp and Darling Petals Die sets. 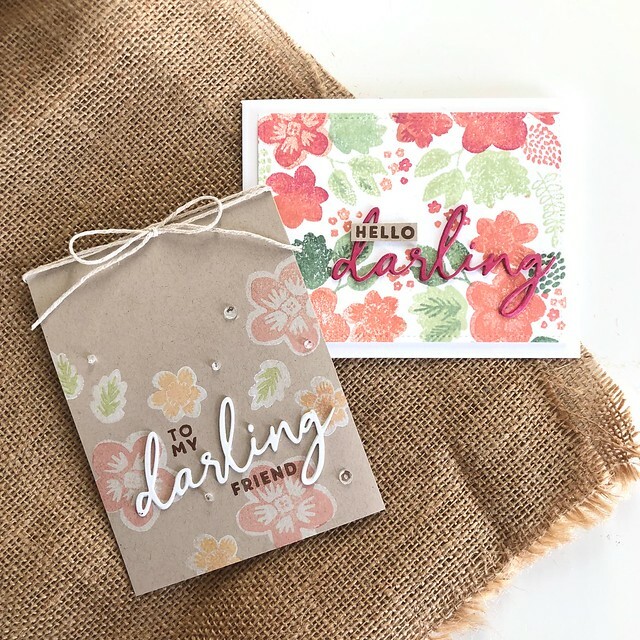 I decided to stamp elements from the Darling Petals stamp set on craft paper for the first card. I started by stamping solid images in white pigment ink so that the colors I stamped on top would show up a little better. I stamped the other flower layers on top of the white images using an assortment of ink colors. 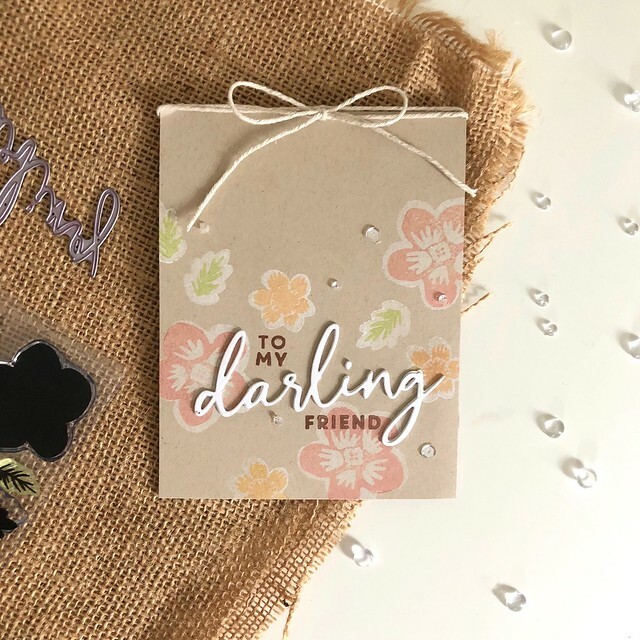 I used the die set for the darling sentiment and then stamped “to my” and “friend” in Versafine vintage sepia ink. 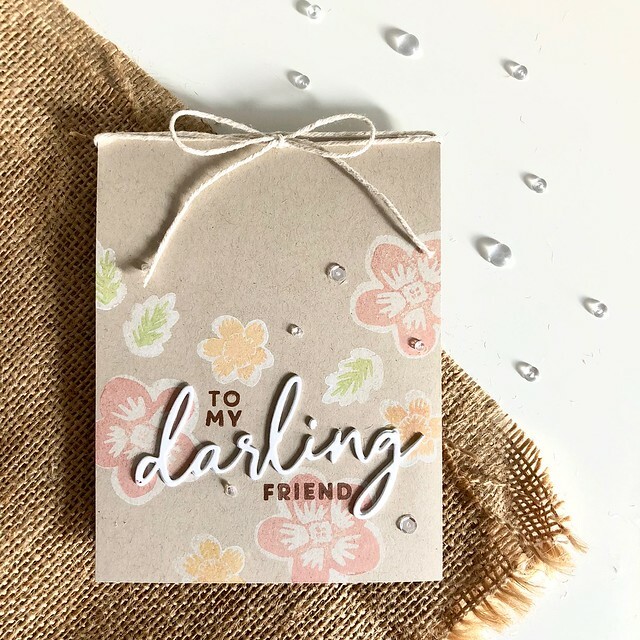 Since the pattern on the card was a little bottom heavy, I added a little twine bow to the top of the card, plus a few clear droplets to add some sparkle. I was excited to try a turnabout stamp for the second card I made. I had to do it the hard way, though, because I don’t yet have a stamp positioner large enough to accommodate the stamp! So, I marked the middle of a 6×6 card panel and the middle of the turnabout stamp and lined everything up by sight as I went. I think it came out ok for having to do it manually! However, you don’t have to be like me! Especially if you have a full-sizeMmisti or other stamp positioner. 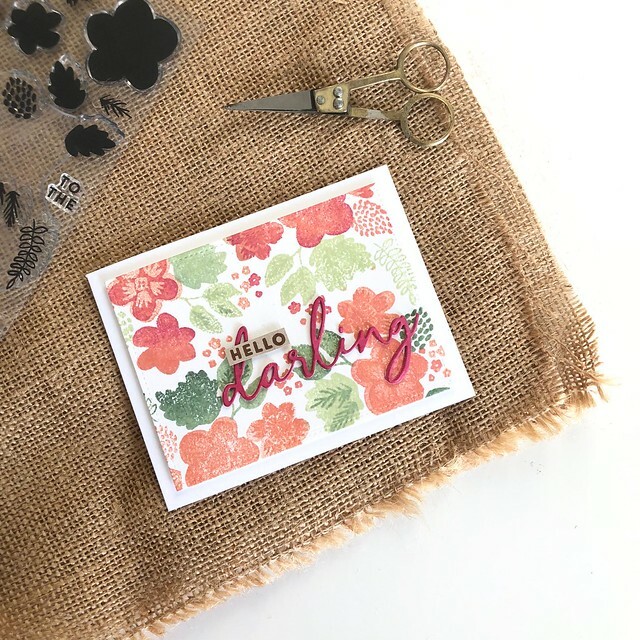 There are lots of good youtube tutorials on how to use this particular kind of stamp, and you can find Angie’s video for the Darling Petals turnabout stamp here. So, I started by stamping the background, then cut it down to a size I liked. 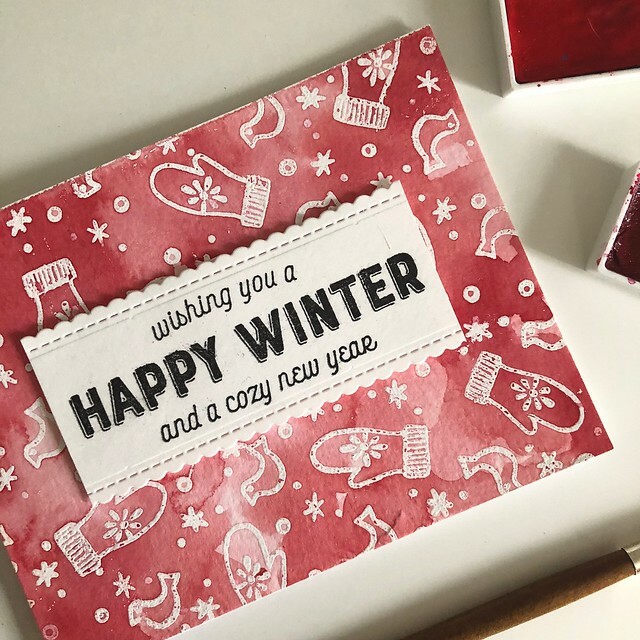 I added the sentiment elements in the same way I did for the first card, except that I popped up the hello on a piece of craft with some foam tape. Since I didn’t have colored card stock to match my background, I just swiped some ink from an ink pad directly onto some white card stock to match my color scheme a little better. Both cards came together quickly and easily, which to me is the sign of a great stamp set! 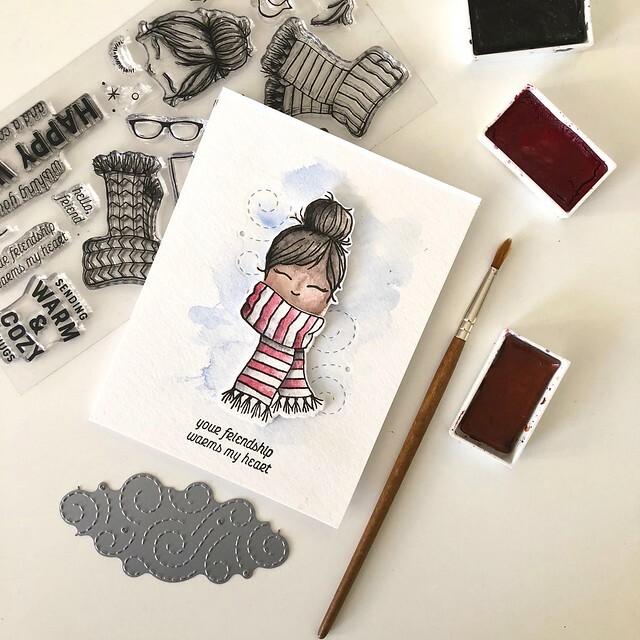 And I think the elements here are nice and versatile – you can quickly create a nice, pretty background with the turnabout stamp, but the other elements of the set free you up to make your own patterns or focal points, too! 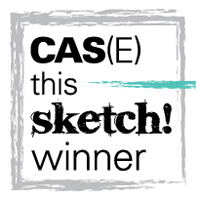 I have some exciting news to share! I’ll be guest designing with <a href="http://Concord & 9th” target=”_blank” rel=”noreferrer noopener” aria-label=”I have some exciting news to share! I’ll be guest designing with Concord & 9th for the month of November, and I couldn’t be more excited about it! 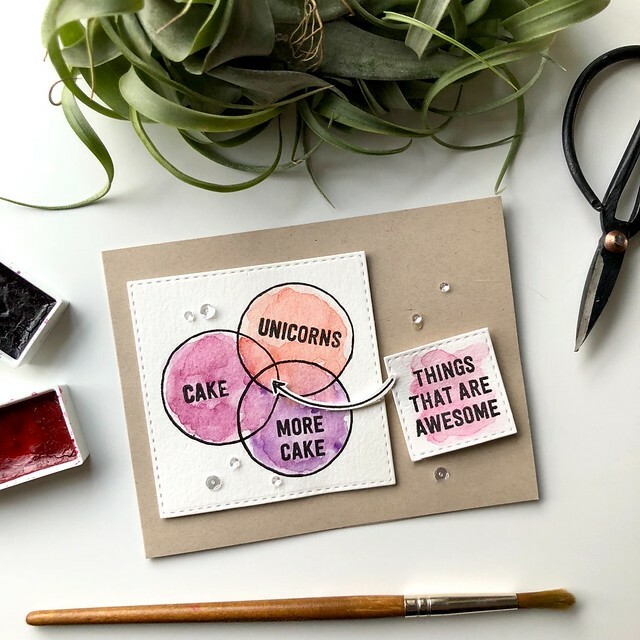 If you’ve been following along for a while, you know I’ve created several cards with their products in the past, and they are always some of my favorites! 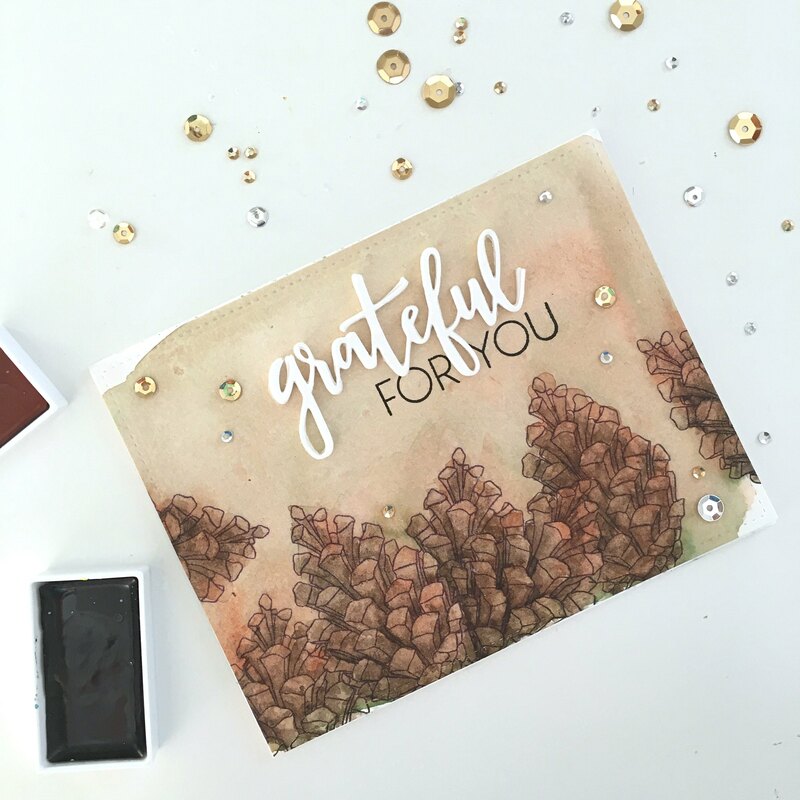 This month, you can follow along here and on their blog for a look into their new November release! (opens in a new tab)”>Concord & 9th for the month of November, and I couldn’t be more excited about it! 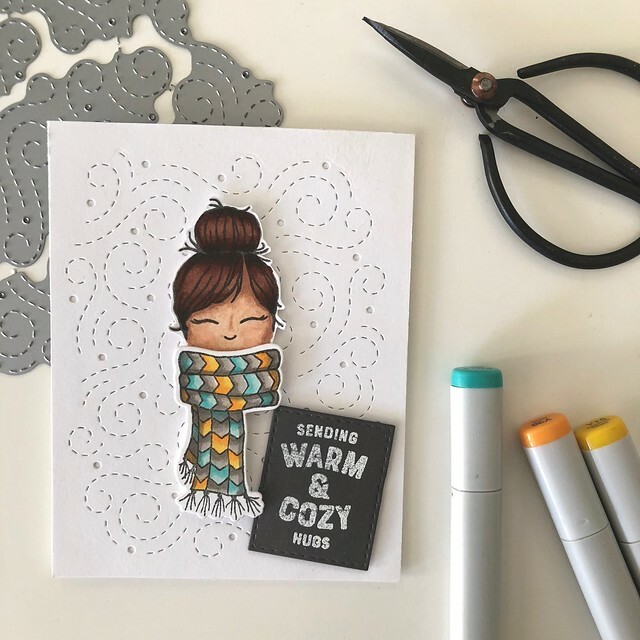 If you’ve been following along for a while, you know I’ve created several cards with their products in the past, and they are always some of my favorites! 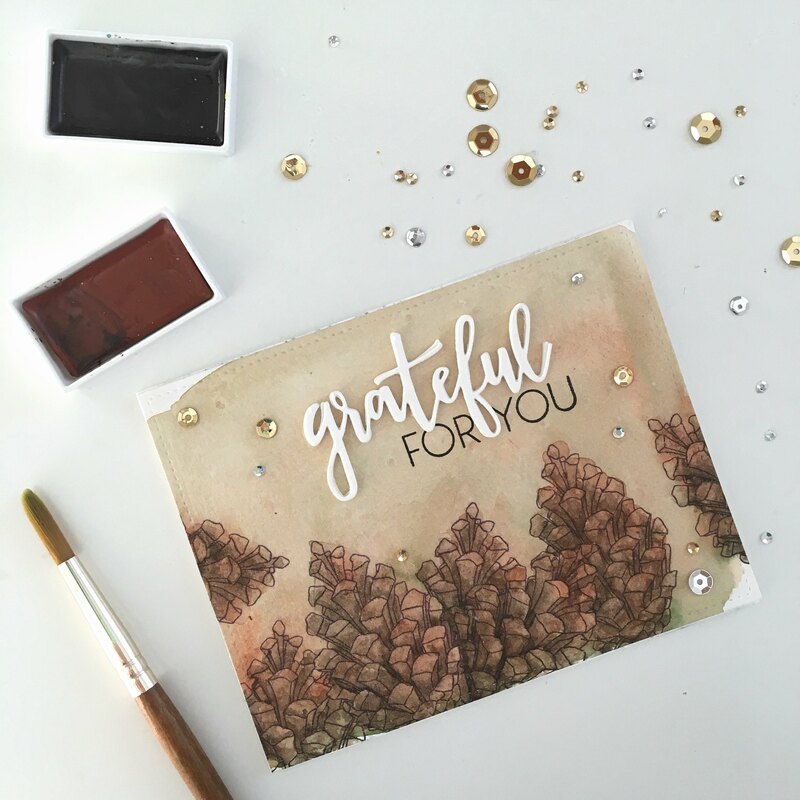 This month, you can follow along here and on their blog for a look into their new November release! 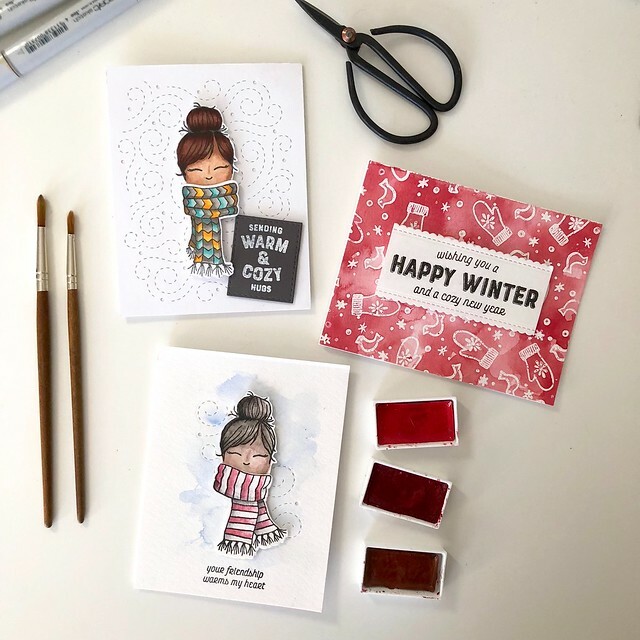 This week, I’m sharing three cards I made using the new Winter Wear stamp set & coordinating dies, and the new Swirls dies. I think the Winter Wear set is just so cute! I was also happy to have a chance to play around with my copics and watercolors to color the images I chose to stamp. For the first card, I used the Swirls die to add a bit of interest to the background panel. I decided not to cut the die apart for this and just used it as-is, to fill up a bunch of space. I like how it turned out. I then stamped the elements I wanted to copic color on some scrap paper and colored in the cute face and the scarf. It was my first time using my copics in a loooong time, but I think the coloring came out OK. I die-cut the scarf with the coordinating Winter Wear dies, and fussy-cut my little top-knot girl and arranged everything on the panel, adhering it with foam tape. I felt like it needed some kind of sentiment, so I stamped an embossed one on some slate grey cardstock and added it with foam tape, too. 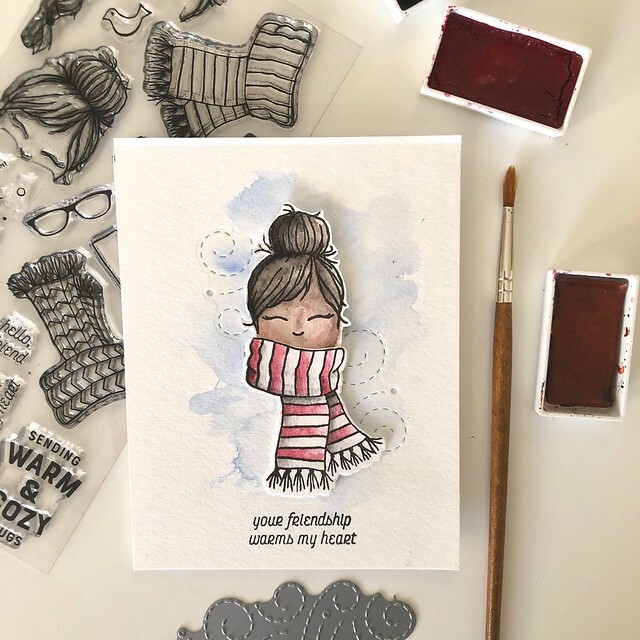 Next up is a similar card, except I used the other scarf, only one part of the Swirls die, and watercolored the top-knot girl (clearly that’s what I’m calling her now…). I think she ended up looking like me! :) A simple sentiment from the same stamp set and she was finished! Lastly, I used some of the smallest images in the set to create a festive card background. 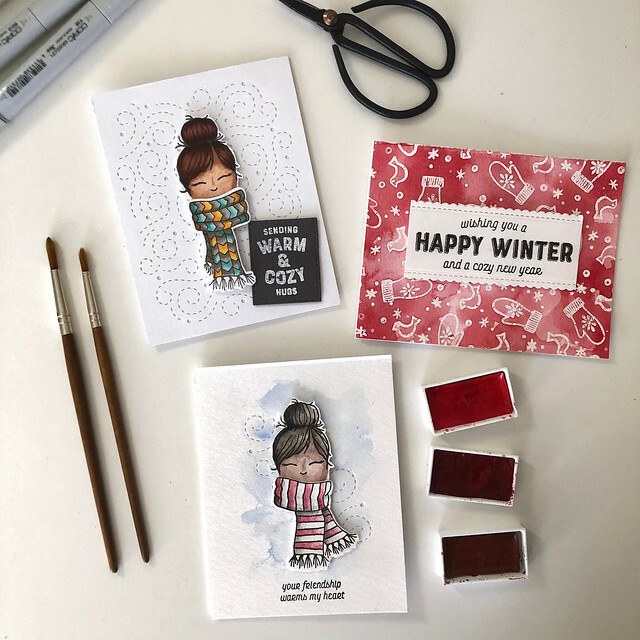 I stamped everything with VersaMark ink and heat embossed it with white embossing powder. Then I watercolored everything in a few shades of red. 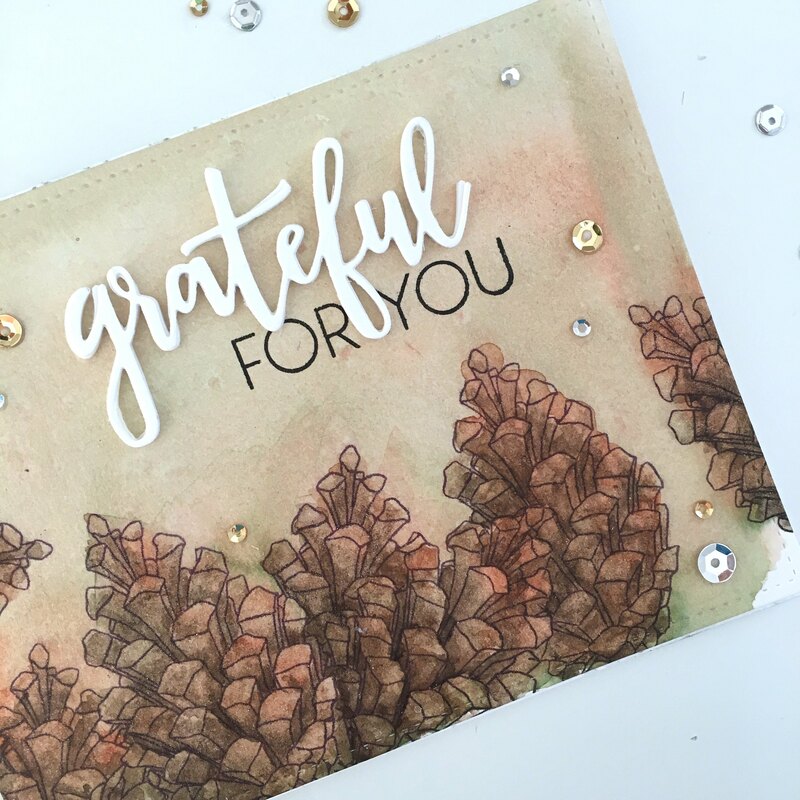 I added the sentiment using the largest sentiment in the stamp set, and embellished the top and bottom edge of the cardstock with a decorative scallop-edge die. Quick and easy! I hope you enjoyed a look at some of the new items from Concord & 9th’s November release (it’s so good! You can even purchase the whole thing as a bundle)! I can’t wait to share more cards over the next few weeks! Head on over to the Concord & 9th blog or their shop to check out the products and some more projects from the other designers! In other news: my baby shower is tomorrow, and I can’t wait! I hope everyone has a great weekend! It’s never fun to have to make a sympathy card, but from time to time it has to be done. I usually struggle with these, because you want to convey so much through a simple card. I often find that keeping it simple and soft is the best way to go. 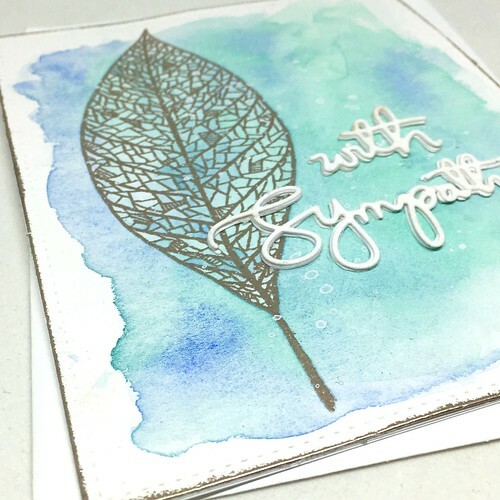 I started this card with a simple watercolor wash (using my Gansi Tambi watercolors). Once the panel dried, I used my largest stitched rectangle die to cut it into a 4.25″x5″ panel. I then stamped the lace leaf with VersaMark ink and heat embossed it with some liquid platinum embossing powder. I also used the VersaMark ink and liquid platinum embossing powder around the edges of the card panel to give the card a bit of extra detail. 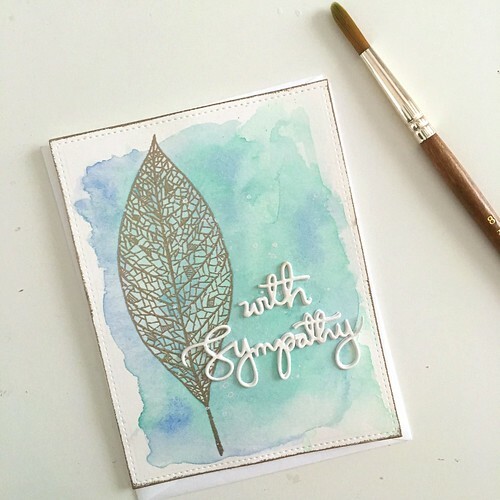 The sentiment is cut from the With Sympathy die – I stacked a few of these for some dimension and adhered them to the card with some multi medium glue in the matte finish. 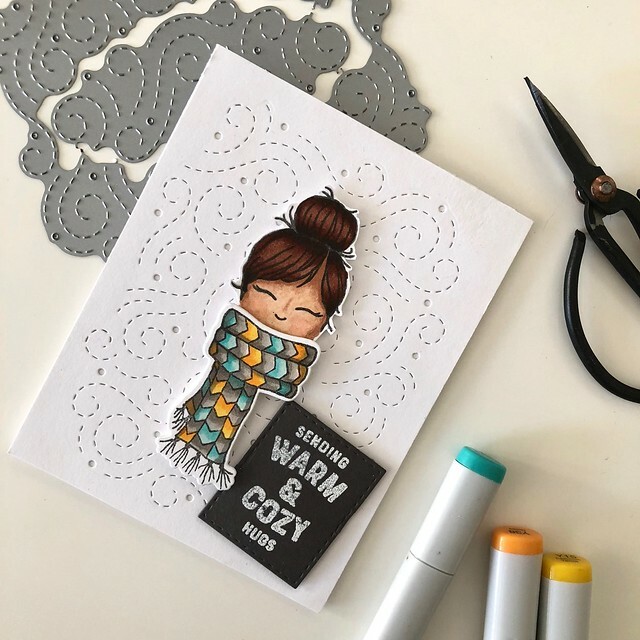 This is such a delicate die, and I am forever getting glue all over the place, so the matte-finish glue is a must for me! I mounted everything onto a card base with some double sided tape to finish it off. As you may know, I’m a big fan of distress inks. I love using them to create backgrounds for cards because of how pigmented the colors are and because of how they react with water. Painting a wash and then sprinkling some water over the panel and using a paper towel to lift away color is one of my favorite things to do. 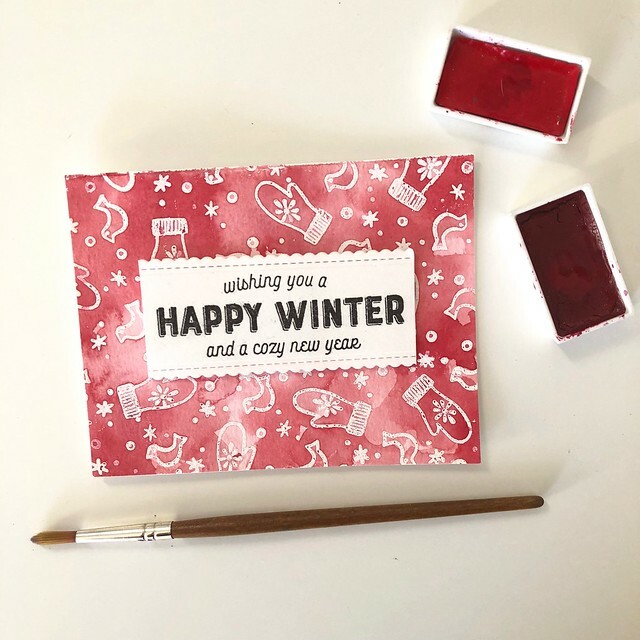 And for this card, I did just that using Worn Lipstick, Abandoned Coral, Wild Honey and Festive Berries distress inks.The card ended up looking so sherbet-y! I started by dampening my watercolor paper with some clean water, and then added a very light wash of my lightest color, Worn Lipstick. I let that dry, and then painted on another layer of color in Wild Honey. Lastly, I came in with a mix of Festive Berries and Abandoned Coral for the final layer. Once everything was mostly dry, I added some water droplets here and there, and some larger puddles of water in other places. In some cases, I let the water dry on its own, in other cases, I lifted the extra water away with a paper towel, taking some of the ink color with me. 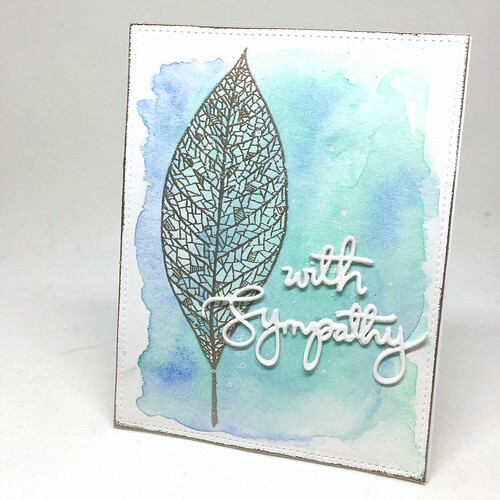 I stamped part of the sentiment in Versafine Onyx Black ink from the Concord & 9th Lace Leaf set. 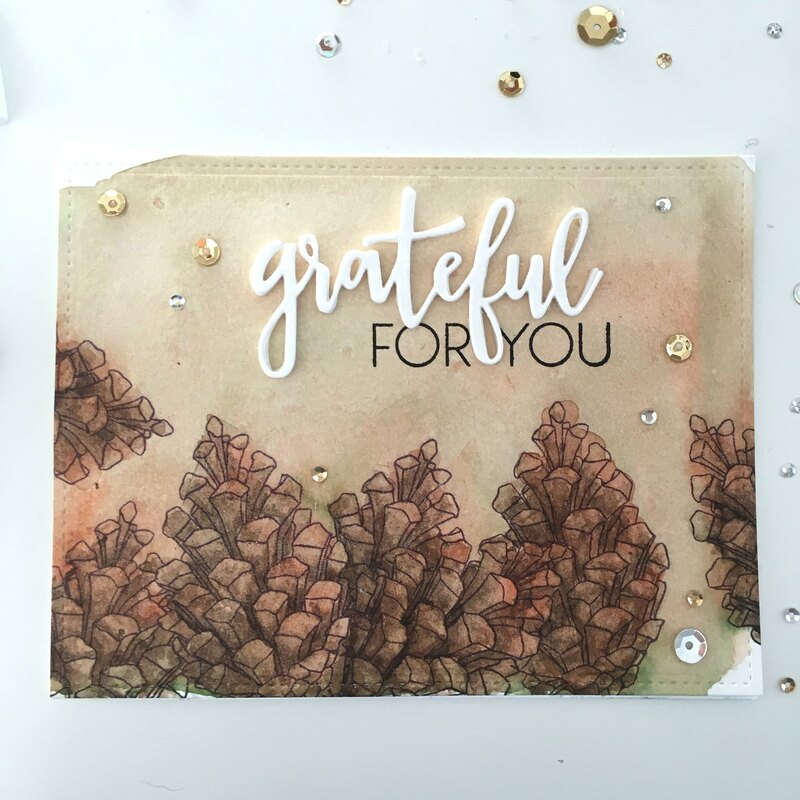 I cut the rest of the sentiment from the grateful leaf die set. After I adhered my panel to an A2-sized card base with some double-sided tape, I added a few clear sequins to finish everything off! Well I’m still going strong with the November 30 day coloring challenge! I can’t believe we’re almost at the halfway mark. I’m having a lot of fun being able to try out different mediums and design ideas. This is my coloring for day 13 – a watercolor panel that turned into a nice, simple thank you card. You can see all of my other posts for the challenge on my Instagram feed. I started by stamping several of the outline pine cone image from the Cozy Christmas stamp set by Concord & 9th. I made a mask for the pine cone so that I was able to overlap some of the image to give the composition some depth. I did all this stamping on some Canson watercolor paper with SSS Intense Black Ink. I then added a watercolor wash all over the panel using a combination of some brown and green paints. After the panel dried, I went back and started painting more color and shading into the pine cones with some different brown shades. I used my Gansai Tambi watercolors for this. After everything was dry, I cropped my panel down to a 4.25″X5″ size using the largest Lawn Fawn Stitched Rectangle die. 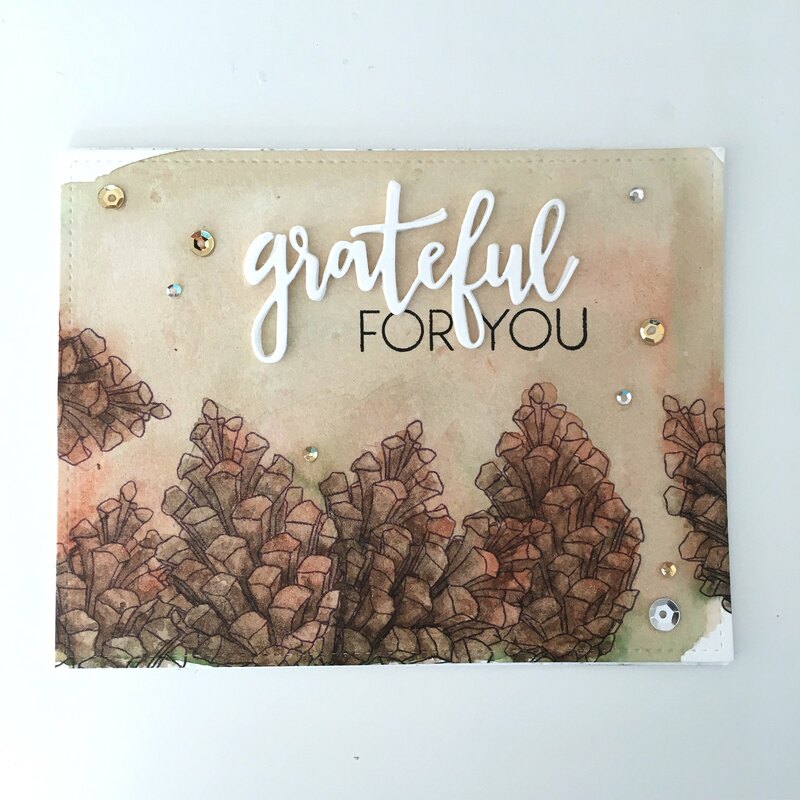 I then stamped the “for you” from part of a longer sentiment in the Lace Leaf stamp set and die cut the grateful sentiment (from the grateful leaf die set) out of some watercolor paper and fun foam. 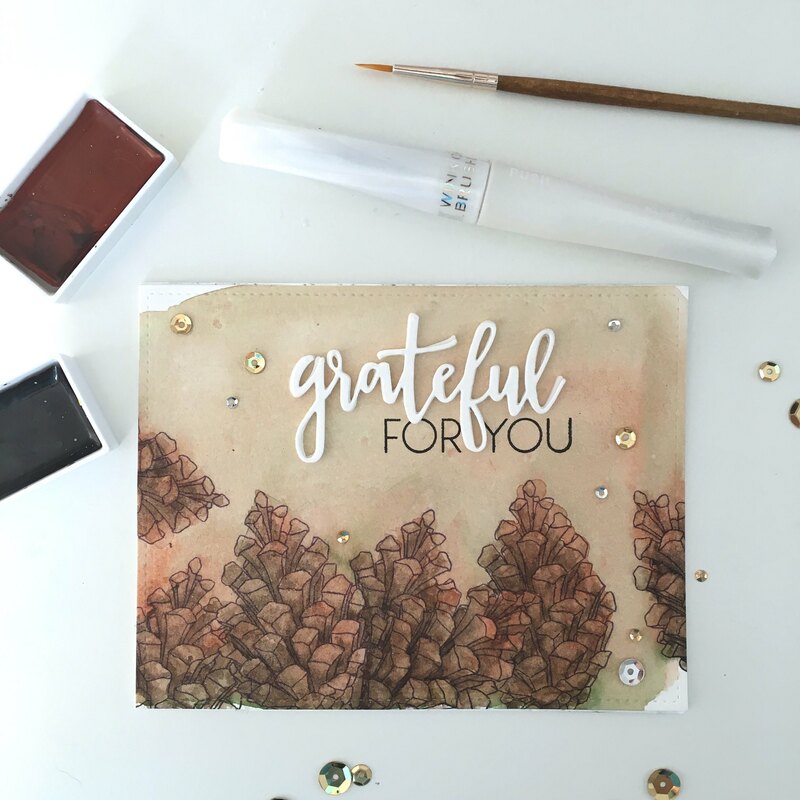 After getting the sentiment together, I thought the card still needed a little something, so I added some shimmer to all of the pine cones using a Wink of Stella shimmer pen. Unfortunately, the shimmer doesn’t show up well in the photographs,. :( Lastly, I glued the panel to a card base and added a few gold and silver sequins.